These therapeutic yoga workshops will include some optional hands-on work, touch, and anatomy that is like medicine for aches, pains, injuries, and tough spots. The sessions will build on each other, so it is helpful to take both, but not required. In this weekend together you don’t need to worry, just be happy! We all possess unique and exquisite aspects of ourselves. This will be a weekend of loving self acceptance, understanding, and laughter. Through the hard work and commitment to the practice of yoga, combined with a weekend of community from near and far, we will all be uplifted. A restorative workshop to nurture your body, and help you get settled (or more settled) your own relaxed nature and the beauty of the mountains. Shoulder Openers, Backbends, and Inversions meant to balance and open you, not knock you off your feet! Twists and forward folds to help you feel cleansed and grounded. Therapeutics for the upper body. This will include some optional hands-on work, touch, and anatomy that is like medicine for aches, pains, injuries, and tough spots. Space is limited ~ Please register in advance by contacting emily@trailswithin.com or call (530) 836-1500. Your space is secured upon arrival of your payment to the studio, either by check or cash. Please email for more info and recommendations. For detailed information about directions, more accommodations, and food please click here. Come celebrate the springtime light of the Vernal Equinox with a weekend of yoga featuring teachers Chrissy Graham and Alice Kennedy. Expect to be stretched, strengthened, and renewed just in time for spring in the mountains! Faculty includes Samantha S. Brown, Kenny Graham , Siri Peterson, Alice Kennedy, Kelly Blaser, with special guests Michelle Bouvier, Dr. Mike Lane, & Rebecca Snowball. Learn to integrate the foundational principles of yoga as applied to asanas, breath, movement and the understanding of philosophy. Deepen and refine your practice of yoga so that it becomes an even greater healing force in your life. Through a powerful group process, learn the tools and develop the confidence to share this method of Hatha Yoga. Practice teaching material learned in the Immersion with others, and learn the central elements of teaching public classes with inspiration and precise alignment. As yoga practitioners we are very fortunate to have the warmth of the practice and the fuel of food and its nutrients to continue that practice. Imbedded in the heart of yoga is the deep desire to see all beings attain what they need in order to be happy. As we move into the season of abundance, we have an opportunity to give freely to others. Please join us for a special group practice as we raise funds for Second Harvest Food Bank in order to feed the many Santa Cruz families that go hungry everyday. Our group donation will be matched by a private donation. Tea and light snacks will be served next door in Poppy DeGarmo’s photo studio after our practice. Tannery World Dance & Cultural Center is proud to support the Santa Cruz community through dance, cultural, and community engagement. Supporting the Second Harvest Food Bank is at the core of our values as a dance arts organization. This six weekend series is open to dedicated students and teachers of yoga and other mind/body healing arts. Continuing education credit through Yoga Alliance with be given to certified teachers. Credit hours will also be given towards the Shakti Yoga Shala 500 hour Teacher Training Program. Continuing Ed Credits available for most holistic health care practitioners. Everyone will learn vital skills to help themselves and others. Deepen your understanding of the body’s master design for optimal health and regeneration. Pinpoint and address specific root imbalances. Through clarifying mind/body understanding, you will begin to read the body more precisely, and enable the potential of rapid recovery of old, unconscious patterns. Learn to help yourself and others to imprint healthy biomechanics patterns that will prevent future injuries. Investment: 1,500 commitment by Aug 30th, 1,650 thereafter. Space is limited. Payment plans available. Individual sections of the training can be taken if space allows. To reserve space send check to Shakti Yoga Shala $400, 834 Memory Lane, Boulder Creek, CA 95006. PayPal is also available for credit cards with a 2% additional handling fee. We will be using “Yoga as Therapy” Volume 1 and Volume two from Doug Keller as the manual. We will also be giving extensive hand outs. Cost of manual is $65 and can be purchased HERE. Focus: Upper Body. Address injuries frequently found in hands, wrists, elbows, shoulders, neck, jaw and head. Issues such as vertigo, sensitivity to light and migraine headaches will also be discussed. Focus: Stress Reduction. Address the digestive system, the thighs, hips, upper back, neck and shoulders. Active and restorative poses will be covered as well as soothing breath work, meditation and deep relaxation (Yoga Nidra). There is no doubt that yoga is a complex and unique way of looking at our bodies and the world. There are so many very valuable ways to understand yoga, learn yoga, embody yoga, and teach yoga. What if we kept it simple, and gently asked the shapes and forms of the poses to whisper to us exactly what we need to know at that time. What if a pose, however complex or simple, had in it a blueprint of understanding in an of itself? This weekend we will work together to understand these poses and what they may teach us. Be prepared to have fun! A deep, slow, mostly restorative class that will focus on bringing peace and harmony to your weekend. Come be nourished and embraced by the perfect, sublime nature of your own body and the nature around us. Expect some mantra and setting of sacred space for the weekend. Suitable for all levels and all body types. How is it that going upside down brings insight into our strengths, our weaknesses, and sometimes our sense of play? 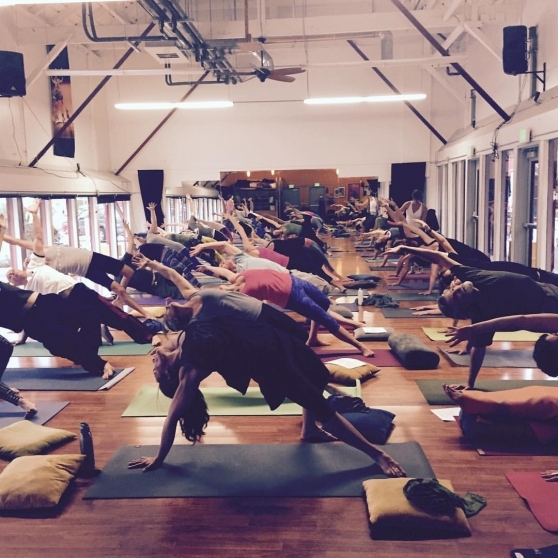 Come learn some practical tools to help build your confidence with inversions. Who knows? You might even have fun! This will be an intermediate class. Mellow down this afternoon with the power of hips, forward folds, and twists. These poses often give us a profound perspective into the core of ourselves. Expect an Intermediate class. This will be a progressive backbending class meant to help you understand your own body’s unique way of backbending. There will be variations given so you bend, don’t break! Designed to be a more intermediate class. Enjoy a group hike in the Lakes Basin where you will be led in a guided contemplation by Alice. Space is limited – Register in advance here. Yoga creates within us an abundance of joy, love, and compassion. It is a potent practice of the heart to share with others, and in the great spirit and beauty of the harvest we have the opportunity to give back. Please join us for a special group practice as we raise funds for Second Harvest Food Bank in order to nourish the many Santa Cruz families that go hungry everyday. The group donation will be matched with a private donation. Both workshops are mixed levels, but not appropriate for beginners who have had fewer than 8 classes or students who have any serious therapeutic needs and would be better served in a private session. Students are encouraged to attend both sessions, as the second session builds on the first. These workshops will sell out. Please register early. Laura Christensen is a passionate, inspiring, highly skilled national and international yoga teacher who has been a dedicated student of yoga since 1990 and has enjoyed 23 plus years of study under many senior teachers in many different yoga styles. She is dedicated to uplifting and empowering her students and cultivating a safe place for deep and real connection within and without. Expect to be profoundly transformed on and off the mat as she skillfully and supportively challenges you and evokes the best version of yourself. Her powerful presence, authentic voice and focus on integrity motivate students to discover new depths within their hearts and new heights in their asana (posture) practices. She is honored to be the November 2012 Yoga Journal cover model and featured teacher, and to be featured in several Yoga Journal issues and online videos over the last 10 years. Her focus includes great attention to the breath, core work, balanced energy, intelligent alignment and practical life-supporting inspiration. To learn more about Laura please visit www.laurachristensen.com.